Okay, so maybe there won’t be a zombie apocalypse… 🤥 But you should still be prepared for the unexpected. In times like these, having a bug out bag ready that you can just ‘grab and go’ means you can evacuate at a moment’s notice. Which is all you may get in some situation – just a moment. That bug out bag will help you stay alive for a few days until you can reach safety, or help arrives. As they say, you never know the value of something until you need it… Or was that ‘until you lose it’?! Never mind then, – and whatever you do, don’t lose it. Just make sure you have it when you need it! In case you’re unfamiliar with the term, here’s a little background so we’re on the same page. A bug-out bag or BOB is a portable kit that normally contains the items one would require to survive for 72 hours when evacuating from a disaster, although some kits are designed to last longer periods. Other names for such a bag are a BOB, 72-hour kit, a grab bag, battle box, personal emergency relocation kit (PERK), go bag, GOOD bag (get out of Dodge), INCH bag (I’m never coming home). or quick run bag (QRB). The term ‘bug out’, on the other hand, is a British military slang for ‘Leaving quickly under fire.’ So the bag needs to be easily accessible that you can grab on-the-go. When it comes to what kind of bag you should use, you absolutely need a backpack. A backpack frees up your hands so you can carry your pets, children or use them to climb up steep ravines or canyons, or, just in case, punch out the walking dead! But 72 hours is a long time – it’s a long time that will give you a way to find a temporary solution or shelter, or others who can join you in seeking refuge. In the mean time, 72 hours is a long time to have to be outside and without additional food and shelter or other people to help you. Just make sure you have these ten bug out bag essentials as part of your final BOB. Hydration is the most critical thing of all your bug out bag essentials. You need access to water in order to survive. Your body can only live for 3 days without water compare that to 3 weeks with only water and no food. The minimum amount of water required per person per day is 1 quart. We recommend that you have at least a 1-liter bottle of water in your bag and a water filtration bottle/straw for the remaining days. A foldable bottle can provide extra space in your bug out bag. With the water filtration bottle/straw, you can fill your bottle from other water sources or sip from the body of water directly with your water filtration straw. But please try to select water that is on the cleaner side of the water cleanliness spectrum! The straw can filter 99.99% of harmful bacteria and other dangerous particles or toxins, but it does not filter out foul taste completely! You don’t want an experience like these crazy guys had! As your primary source of fuel, food is the second most critical thing in your bug out bag essentials list, if you want to have enough energy to keep going for any length of time. You want food in your bag that’s not too bulky and at least enough for 3 days. Think survival and energy, remember: this is not a picnic trip… I repeat… not a picnic trip! You’ll want a combination of ready-to-eat and some easy to cook just by boiling. For ready-to-eat, energy bars/protein bars are good options. You may opt to get Dehydrated Meals as well but remember that anything that needs cooking will require you to have cookware with you in your bag. Don’t forget to bring fire starters with you if you are going to cook. A spork for eating and a can opener may also be needed if you opt to bring ready-to-cook meals. You might be better off with freeze-dried emergency foods and meals you can open without tools. The best set of clothes to bring in the bag for each person will depend on his or her surroundings. The general guideline here is to bring clothes that will help you regulate your body temperature. The goal here is preventing hypothermia and hyperthermia, so it will depend on your location, time of year, and your tolerance for hot and cold temperatures. Bring at least 2 sets of dry clothes to make sure you always stay dry. Wet clothes can play a critical role in whether or not you are susceptible to hypothermia. For those with extreme seasons, make sure to have different sets of clothes you can swap out whenever the season changes. The last thing you want is unusable clothes for the season. Make sure to select clothes that blend in easily in your local scene or environment. You don’t want to provoke unnecessary attention and be a target for petty crimes by wearing shiny clothes. You’re just asking for trouble, Michael! Steer clear of blue jeans, as well. They might be comfortable but they take forever to dry if they get wet and it’s not hot and windy out. Since they’re cotton, they also absorb water very well. You don’t want that chafing and cooling effect of wet jeans when you’re out in the urban jungle trying to find a warm shelter. Make sure to include extra socks as well – in case you need to sleep outdoors, they’ll provide added temperature regulation. Don’t forget fresh underwear! I almost forgot! Your body can only take so much. At the end of the day, you need to have time to rest and recover. Having a good night’s sleep is critical to making progress to your next day. You can’t rely completely on evacuation centers and abandoned buildings for shelter. It’s best to have your own makeshift shelter for that stressful night away from home. A shelter can also shield you from harsh elements like heavy rain, snow, and the scorching heat of a glaring sun. You can choose between small lightweight tents that can be attached to the outside of your backpack or just a sleeping bag. If your BOB space can afford it, it’s better if you can bring both for more comfortable sleep and potentially better rest. For hot environments, another choice is a simple hammock you can attach to two stable pillars/trees and a tarp to cover the hammock. Your choice will also depend on the environment in the vicinity. This is one of those bug out bag essentials where you need to be able to make dynamic choices that fit your situation and location. Different places have different shelter requirements so I leave it to your best judgment which type to include in your BOB. This is one of the most essential items in the list, especially in winter. You’ll need a fire if you need to cook. It also acts as a natural heat source when you need to get warm – you know – regulate that body temperature. When you’re out in the woods, it also repels animals because they see fire as something dangerous and won’t come too close. It’s also an insect repellent because insects hate the smoke it generates. Survivalists say you need at least 3 different ways to light up a fire. One is your main source (the easiest way to start a fire), the other is the backup, and the third one is the backup of the backup. You can have a lighter as your main source, a waterproof match as your backup, and a fire steel as your third option. Here’s a cool way to easily start a fire using a fire steel with cotton and Vaseline as tinder. We can’t emphasize how essential fire is when it comes to your survival outdoors. It isn’t part of the bug out bag essentials list for no good reason – it really can save your life: from keeping you warm to making a signal fire to heating water and food. Don’t skip this one! Prepare a small first aid kit which contains enough supplies to handle small wounds, big wounds, and medicine for allergies, flu, and diarrhea. It doesn’t have to be expensive. You can basically have a cheap first aid kit by getting the items from the dollar store! A small cloth or plastic pouch is perfect for your BOB first aid kit. Steer clear of the heavy and bulky metal types. Include also medicines/topical applications to handle those that you know you and your family are vulnerable to. An insect repellent might also help in areas prone to insect-borne viruses. Don’t offer your blood to the mosquitoes! You can make a great nontoxic homemade mosquito repellent with this simple recipe. The best tools to include in your bug out bag essentials are tools that are multipurpose. These tools can help you assess the current situation or help increase your odds of survival. And of course, in this case, they need to be portable. You can bring your hammer, your saw and your axe, but good luck with carrying them all during an evacuation! One of the main purposes of these tools is to help you know if it’s safe for you to go back home or if you need to move further away from danger. This is a good reason to bring a local map so you can figure out where you are. A local map can also help you identify possible escape routes that you may not be familiar with. it can also help you find outposts, nearby dwellings and other landmarks, potential shelter and the closest water sources. The ennoLogic eA980R Weather Meter is an awesome tool to include in your bug out bag. 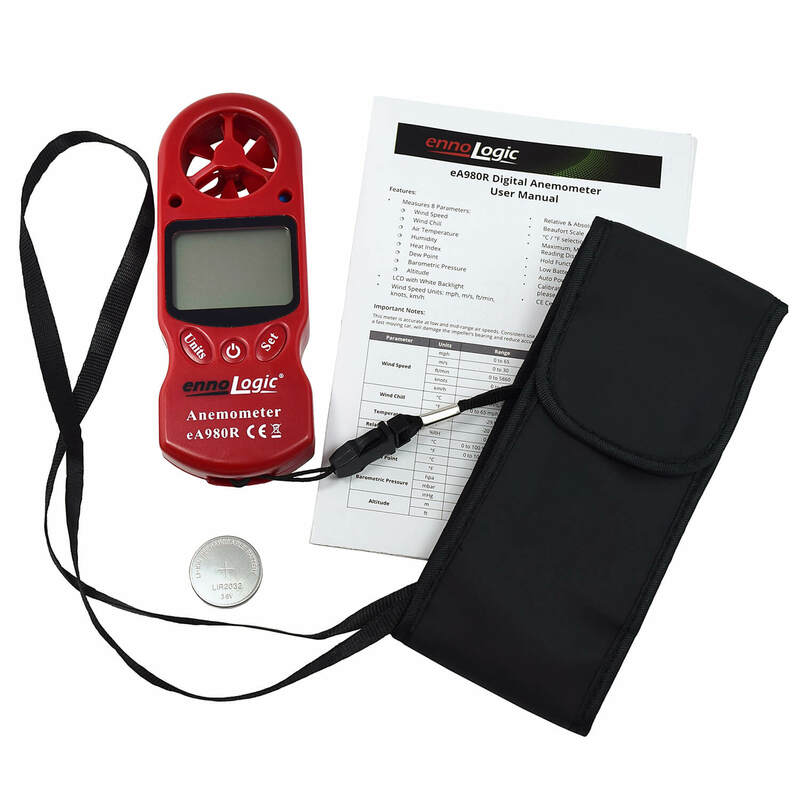 Having an anemometer is also critical to stay upwind of volcanic ash or radioactive contamination. By knowing the direction of the wind and its speed, you can have an idea if you need to move to new location and how urgently (and fast) you need to move. A multipurpose anemometer like the ennoLogic eA980R gives you not only wind speed readings but also barometric pressure, pressure altitude, heat index, wind chill, temperature, dew point, and relative humidity. You literally have a weather station in your pocket™ It’s also super small, light, and easy to carry, and will definitely fit in your BOB. The anemometer’s barometric pressure feature can be used to predict incoming storms or bad weather or when to expect better weather. This feature can also be used for checking if there are fishing opportunities in nearby bodies of water. A medium-sized knife is also a multi-purpose tool you can use throughout any evacuation scenario when you are making do in the great outdoors. There are lots of potential ways a knife can come in handy. Cutting ropes/cables to use in setting up a tent, cutting up food, cleaning a fish or even cutting up small brush and dry grasses for fuel for your fire. During a crisis, the ‘rule of law’ sometimes ends up under the bus. Most people will not have prepared for a catastrophe. Unfortunately, some of them will invariably try to survive by committing petty crimes. Either steal food from groceries or harass people and trying to take their supplies from them. A medium-sized knife can also act as protection from these kinds of people. But you should know your capacity to act in these situations. You may need special training to prepare to protect your family or belongings if needed. Having a working cell phone is a big advantage as long as coverage is still available. And while we know in many natural disasters coverage can be lost, it’s still worth bringing your phone along because it’s small and can potentially connect you to the rest of the world. In order to charge that phone, it’s best to bring a solar-powered power bank. This kind of power bank only needs good old sunlight to work. A smartphone can provide critical information and updates if you use mobile data. Bring a portable radio as well for updates if your phone does not have mobile data or stops working. A constant source of light during dark hours will help tremendously. If you need to step out or look for items at night, a flashlight or a headlight is essential. You can expect electricity to be out for a long while once it goes out in a natural disaster or any kind of catastrophe, so dark days are upon us 🙈. For this, you can use solar-chargeable lights. Or, you can bring multiple batteries to last for at least a few days. Choose lights with LED bulbs for bright light with low power use. A few emergency glow sticks won’t consume much space in the bag either and need no power. When filling your BOB, prioritize items that are non-negotiable such as these bug out bag essentials. Then, if you’ve still got enough space, you can add other items to make that 72-hour easier. Just make sure that your bag is not so heavy that it becomes a handicap to carry it. Remember that there is no perfect checklist for a BOB, so don’t be anxious over it. Instead, make it personal to you. It is a backpack that you know will give you the best chance of surviving for a few days. Nice article! I like this article so much. I found this very interesting, informative and helpful. Thanks for sharing and keep sharing.